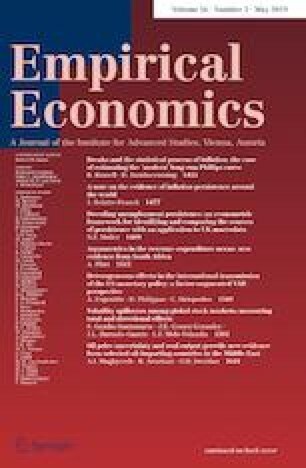 In this paper, we use the synthetic control method to estimate the macroeconomic losses from the 2010 earthquake in Haiti, one of the most severe natural disasters in the modern era. The macroeconomic effects of the earthquake were equal to an average loss of up to 12% of gross domestic product over the period 2010–2015. While surges in imports and foreign aid supported a temporary increase in aggregate consumption, aggregate investment and services sector output experienced large contractions. The road transport sector was severely affected. Impacts on electricity use have been less pronounced. The data suggest that macroeconomic losses may be permanent. The earthquake is thus a case of an extreme natural disaster contributing to divergence in development outcomes. The online version of this article ( https://doi.org/10.1007/s00181-017-1405-4) contains supplementary material, which is available to authorized users. We are grateful for comments from Terence Wood, David Stern, Yusaku Horiuchi, Sadia Afrin, Ryan Edwards, Huy Nguyen, anonymous referees, and participants in the Arndt-Corden Department of Economics Seminars. This research was also supported by an Australian Government Research Training Program (RTP) Scholarship. The datasets of this paper (1. data, 2. code including instructions) are collected in the electronic supplementary material of this article. Ratio of MSPE in the post-earthquake period to MSPE in the pre-earthquake period in logs for wholesale, retail, restaurants, hotels. Consumption share of GDP for Haiti and Synthetic Haiti. Ratio of MSPE in the post-earthquake period to MSPE in the pre-earthquake period in logs for Net ODA and official aid received. Total primary energy supply (thousand tonnes of oil equivalent) for Haiti and Synthetic Haiti. GDP per capita (constant 2005 US dollars) for Haiti versus Synthetic Haiti, donor pool of five countries.